Chung C. Fu, PhD, PE, FASCE, is research professor and bridge consultant, and director of the Bridge Engineering Software and Technology (BEST) Center at the University of Maryland, College Park, Maryland. His publications include 50 referred publications, 20 publications, more than 100 presentations and conference proceedings, and 50 public technical reports. His areas of expertise cover all types of structural engineering, bridge engineering, earthquake engineering, computer application in structures, finite element analysis, ultra high-performance concrete, steel and composite applications, including fiber-reinforced polymer and high-performance steel for innovative bridge research and construction, bridge management, testing (material and structural), and nondestructive evaluation applications. Shuqing Wang, PhD, PE, is a senior GIS specialist on contract with the Federal Highway Administration; research fellow/bridge consultant in bridge software development and structural analysis at the BEST Center, University of Maryland, College Park, Maryland; and former director of the Bridge CAD Division at the Department of Bridge Engineering, Tongji University, People’s Republic of China. His areas of expertise span from leading-edge software technologies to bridge engineering practices, especially modern bridge modeling and structural analysis system development. His research interests now focus on visualizing structural behavior in real time and representing bridge geometric and mechanics models in three dimensions. "With the increasing complexity of bridges today, bridge engineers require more contemporary references on the topic of bridge analysis. This book provides a great desktop reference for the entry-level to the seasoned bridge engineer. The authors have provided a great balance in theory and application to cover the spectrum of bridge types we design, rehabilitate, preserve, and repair in the industry today. 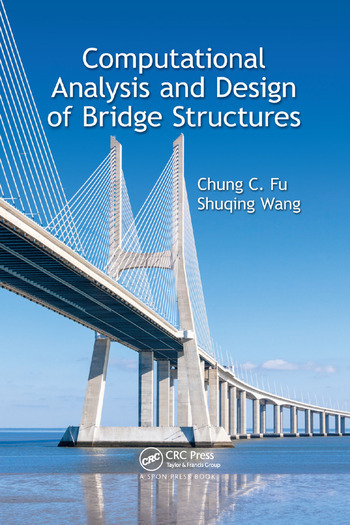 The analysis of bridges continues to evolve to meet the complexity of today’s bridges - this book will serve as a vital tool to bridge engineers challenged with implementing a more refined analysis." "Modern bridge design has evolved, along with the technology of computers, exponentially in our time. The expertise offered by these authors in this book will be invaluable to anyone interested in learning modern bridge design thru computer modeling. All of the available options for computer modeling are discussed along with their pros and cons, and are demonstrated with examples and powerful graphics. …The application of today's computer technology to the art of bridge design can be a big challenge. This book lays out the available options and their limitations, for the use of computer modeling in designing virtually all types of bridge components, structure types and span lengths."